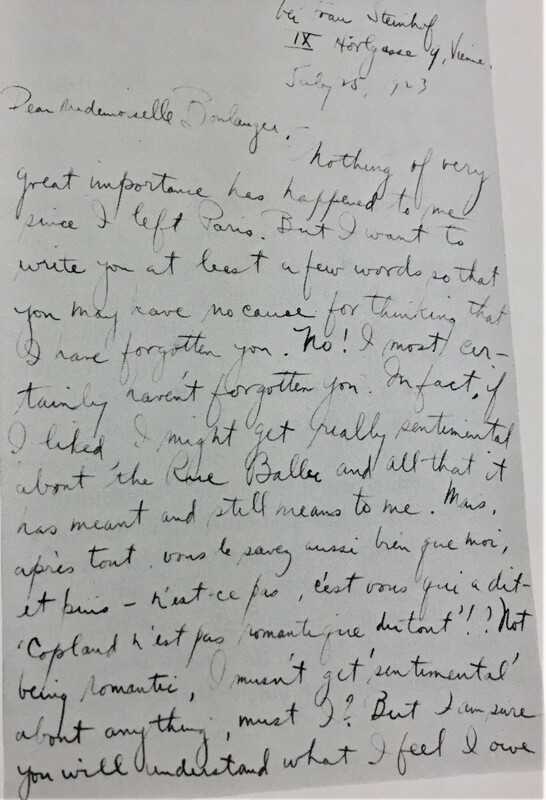 As I am researching the Lomaxes for my final paper and for future work this spring, I took this opportunity to look through March of Time for any evidence regarding Lead Belly and his interactions with John Lomax. I was not disappointed. 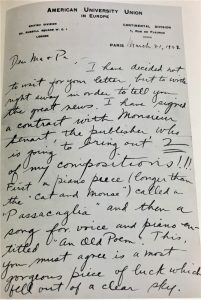 In a video that Professor Charles Dill calls “disturbing,” Lomax and Lead Belly “recreate” their meeting and the story of their travels together through the Northeastern United States. The March of Time series on the whole appeared quite groundbreaking in the 30’s through 50’s, when it ran. The mini documentaries of March of Time tackled some uncomfortable topics like Nazi sentiment in Hoboken, New Jersey in 1938. Though today we might see this as a shining example of forward, positive thinking and challenging the public, the series also is a little strange – many of the videos there aren’t actual film, they are in fact recreations of events. Think of a worse version of the producers of “Survivor” re-filming the players’ dramatic moments. 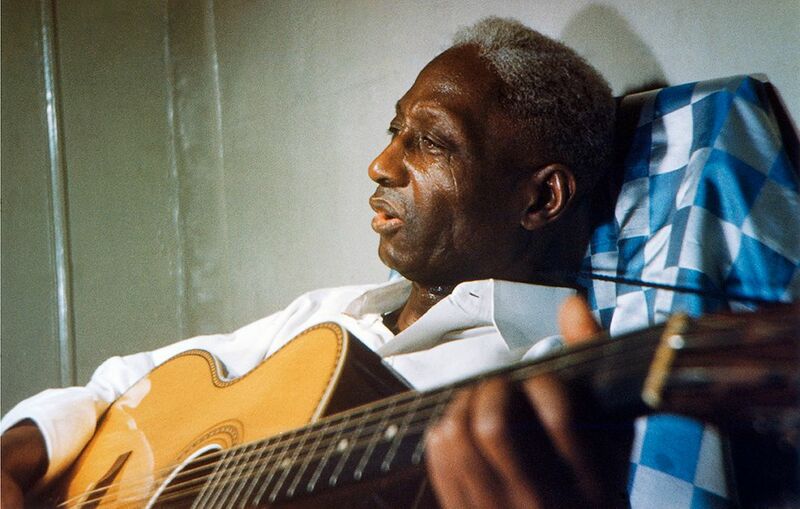 The video in question regarding Lead Belly and John Lomax, titled “Leadbelly,” is a recreation of the meeting of Lead Belly and Lomax. 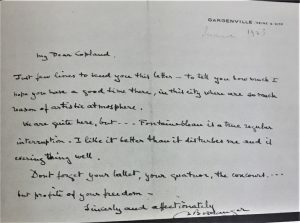 It says that Leadbelly was released from prison (where he was being held on charges of murder) due to Lomax’s influence, and that Lead Belly was so grateful that he dedicated his life to following Lomax. In real life, however, Lomax and Lead Belly’s song for the governor had no influence on his release. The myth lives on, however. More concerning than the false story, however, is the marketing of Lead Belly and the marketing of Lomax in the film. Lead Belly, in prison clothes, speaking of murder so openly, is a man in need of a friend. Lomax, the one who acts almost as Lead Belly’s conscience in the dialogue, appears not only as a friend, but as Lead Belly’s white savior figure. Follow this link to watch the video yourself (hopefully this will be available to embed on this page if I can get WordPress to cooperate). I have a lot of words to describe my reactions to that heading but I can sum all of them up with an all-encompassing “yikes.” I believe that the Lomaxes, despite whatever intentions they had to the contrary, contributed to the othering of black folk music in the way they “introduced” black folk singers like Lead Belly to the general public and made them hit sensations. I look forward to further researching this in my work this semester and this coming spring. Here is a Lead Belly spotify playlist, for reference to his work. 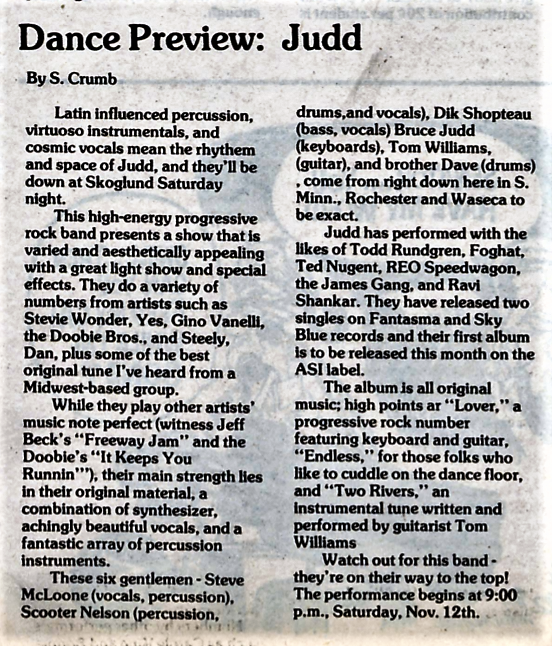 What on earth could Steely Dan, The Doobie Brothers, and St Olaf all have in common?The band “Judd.” The Judd Group found popularity in the 1970’s with their original songs and covers of the music of Steely Dan and the Doobie Brothers. They toured for 10 years, had two hit singles, and opened for Lynard Skynyrd, The Beach Boys, and Tina Turner. A group of a few white, midwestern young men, their sound, which infused black music traditions into their rock sound (such as blues, soul, jazz, and folk), stands as a hodge podge representation of more popular bands of the time. On Sat., Nov. 12th, 1977, Judd played a gig at St. Olaf College in Skoglund Auditorium. As the equivalent of the current St Olaf MEC fall concert, it was quite an event. Their covers of the Doobie Brothers’ “It keeps you Runnin” and Jeff Beck’s “Freeway Jam” were well received.The Manitou Messenger covered the group and praised their playing and overall entertaining. They drew inspiration from Steely Dan’s incorporation of jazz into rock, and from the Doobie brother’s use of folk and later soul music into their work. These groups all help represent a movement from the 60’s and 70’s of incorporating black music genres into rock music. As we can see, this movement was quite popular, and I think we should consider the implications from this. Since popular rock bands incorporated certain genres in their sound, they essentially bridged a gap between their sound and genres often associated with black Americans, like jazz, soul and blues. They labelled themselves as “folk rock” – but more accurately, it was “black folk rock” – though it was more often than not sung by white musicians. This could be seen as a good thing – a way to expose these genres (which admittedly had exposure already from plenty of other white performers and POC’s) to a crowd which was perhaps more concerned with rock and newer genres. However, I believe that it also helped erase some of those older black folk genres and create impressions of these genres that weren’t necessarily true. 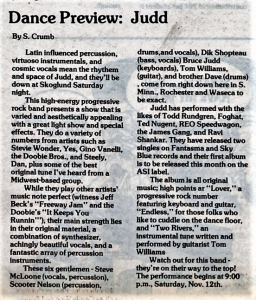 In the Manitou Messenger article above, for example, the reviewer refers to the percussion of the Judd group as “Latin” inspired, but on listening to examples of the group’s work from their website, it isn’t “Latin” inspired at all – the reviewer falsely attributed a different (but also marginalized) culture to the music because they weren’t familiar enough with the black folk genres they were hearing to tell a difference between that and something else. They perpetuated their stereotype of what they thought Latin percussion to be instead of relaying what actually was in the music. The video below shows the group performing some original works and covers, and here you can listen for yourself to hear the inaccuracies in the Manitou article. While the Judd group is not quite popular enough to merit a space in the St Olaf vinyl collection, they do have records of the Doobie Brothers and Steely Dan – both of which I believe would be excellent additions to our exhibit as we explore the implications of white performers incorporating and appropriating black music genres into their works. 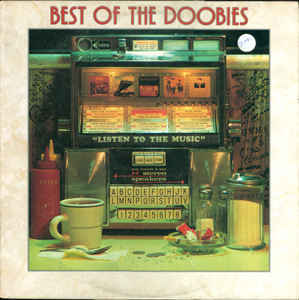 While Judd’s work cannot be found at the St Olaf Library, I think that the records St Olaf does have of the Doobie Brothers could be a nice addition to our library exhibit here at St. Olaf. It would display a group that used black folk elements in their rock sound, like in “It Keeps You Runnin” and “Black Water,” where they incorporate blues and soul and say “like to hear some funky Dixieland, pretty mama come and take me by the hand.” Particularly in “Black Water,” the pitch bending, dialect, and instrumentation all point to folk genres in the black tradition. I also think that this would accurately represent what St. Olaf Students at the time were listening to, and it would be nice to do a snapshot portion of the exhibit to look at St Olaf Student’s perception and reception of black folk music and its incorporation into rock. 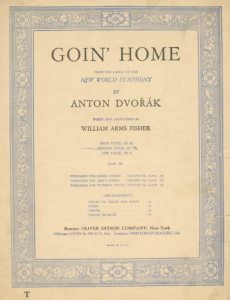 While scrolling through the sheet music consortium, I stumbled across a digitized piece of music of which I have a physical copy in my own personal library, “Goin’ Home,” an adaptation by William Arms Fisher of Anton Dvořák’s New World Symphony (No. 9, mvt II Largo, specifically). Personally, I love the symphony and have enjoyed listening to it for many years, but I can’t help but wonder now about the complicated philosophies of Dvořák and this adaptation of his work which place the work not just as a well-known music history class example to memorize, but a work that has juxtaposed good intention with possible misguided ideology. 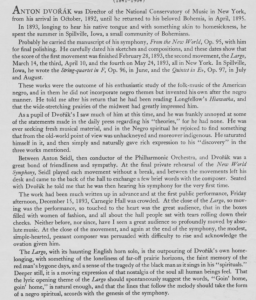 The sheet music I found includes a detailed account of Dvořák’s intention behind the New World Symphony and the melody on which this vocal piece is based. 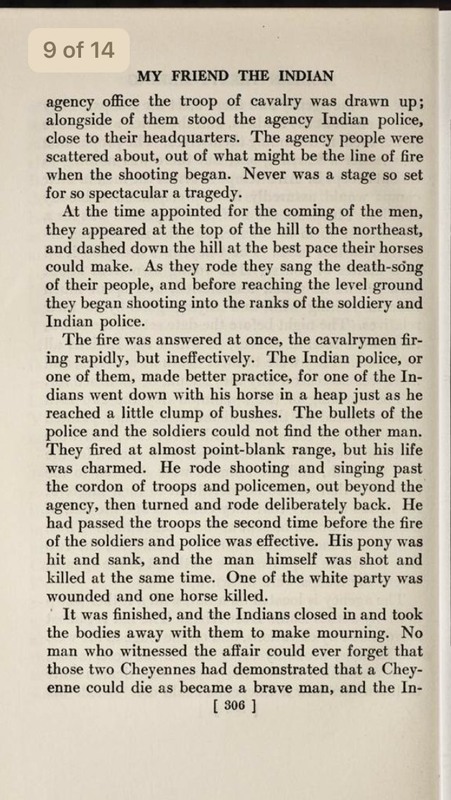 This description, shown to the left, describes Dvořáks fascination with the native people of the US. 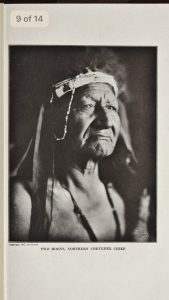 In his own desire to see his home, he attempted to fully understand the Native American and black music traditions which showed the true roots of American culture. 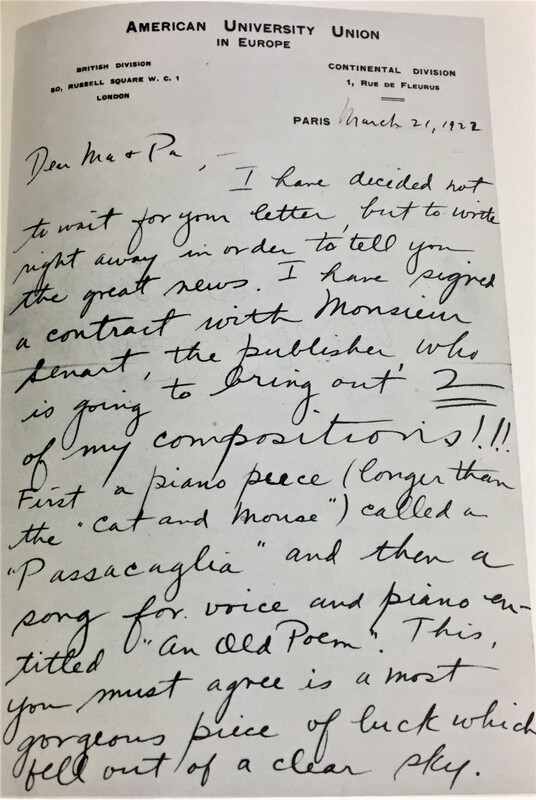 I think, overall, the attempt of this work to show Dvorak’s intent shows in the written dialect on the words “I’m Jes’ goin home” and “Gwine to roam no more.” Clearly, Fisher’s adaptation attempts to look to Dvořák’s attempts to draw on black folk music. 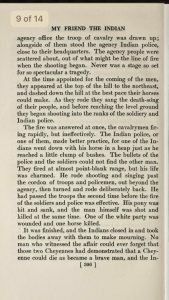 The music does say that the singer may omit the dialect, which shows that people of all backgrounds were encouraged to sing this music. 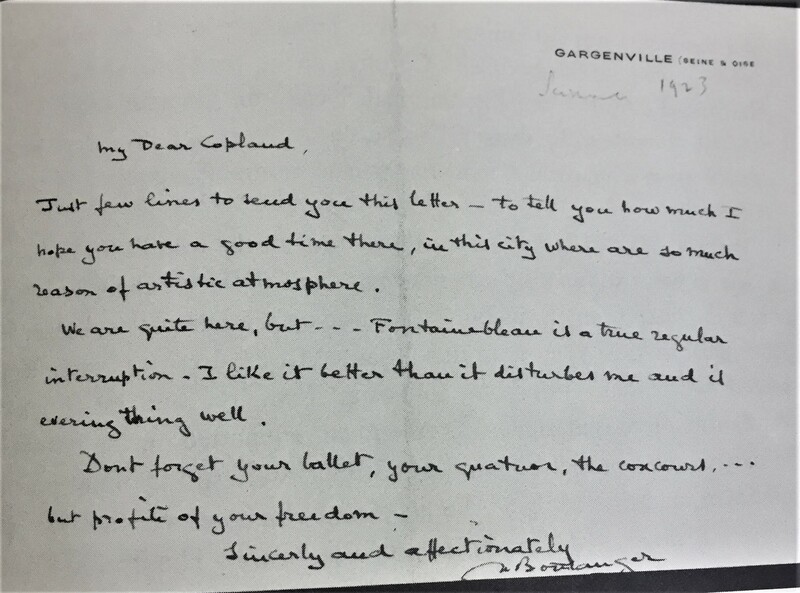 We also know from the forward of this piece pictured above that Dvorak, while attempting to make an example of true American music, also drew on his own experiences. 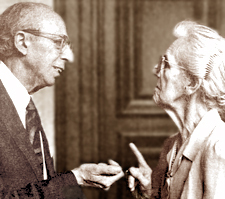 The spirit of his work was meant to be applicable to many people. 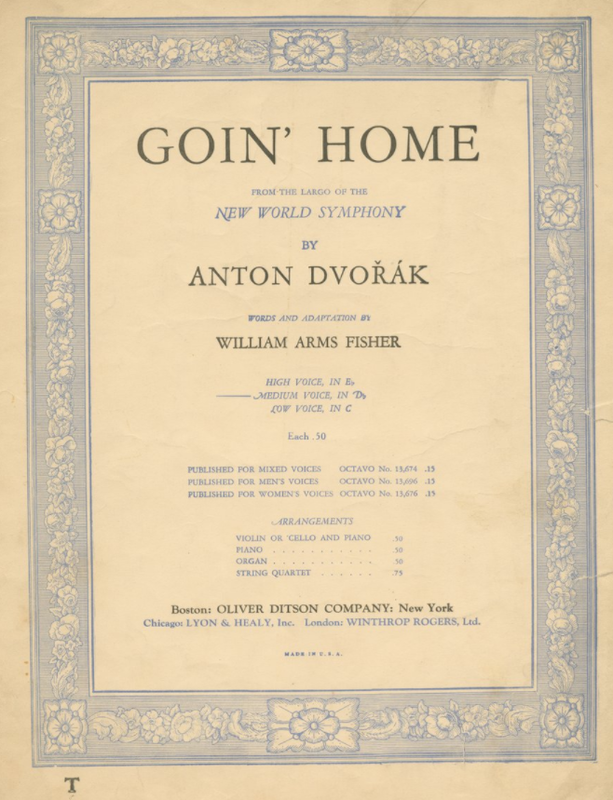 In “Goin’ Home,” Fisher develops Dvořák’s yearning for his own home into a universal message of hope for anyone searching for home. 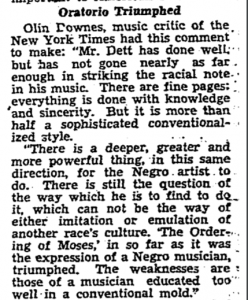 However, the message is pointedly not universal when it is directly associated with black folk music. 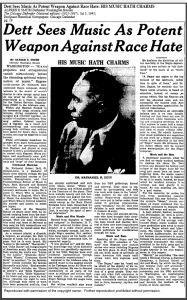 Even more so, the white composer and arranger have not used an actual black folk tune but made one up – this causes confusion and leads people to believe that the song is originally a black folk tune. Instead of lifting up an already existing melody in the black folk tradition, Dvořák stereotyped his idealized version of folk music and missed an opportunity to showcase genuine, authentic folk music. While the attempt seemed earnest in its good intent, the execution remains slightly subpar. 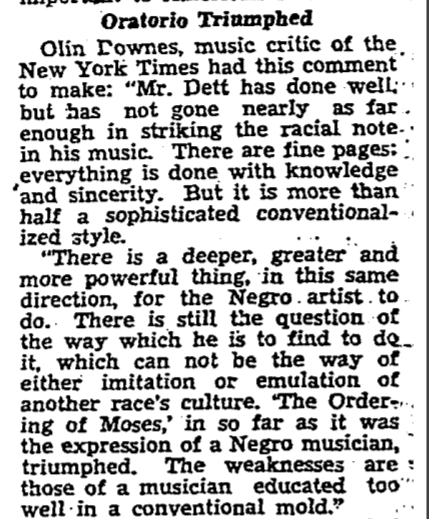 We must also consider what it would have meant if he’d used a black folk melody. Would appropriating one have been much better? 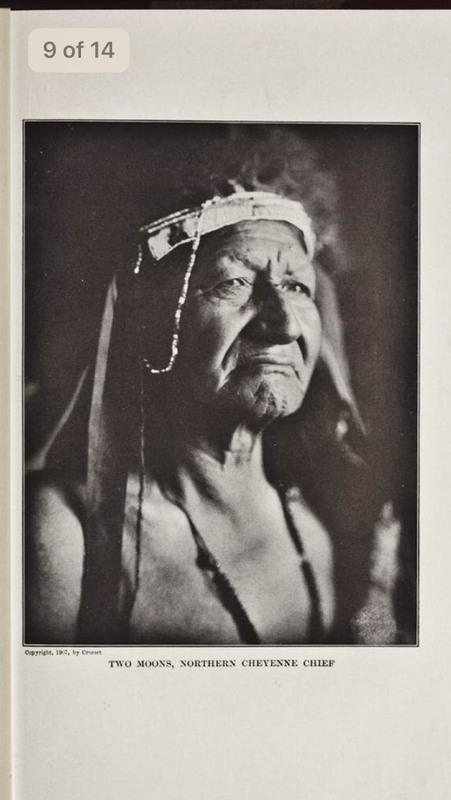 He was stuck between creating one on his own and using an existing one – both appropriation and creation would have contributed to the erasure of this culture in some form, though. As someone who was not part of the black folk tradition, it would have been impossible to find a way to authentically emulate these traditions without erasure. 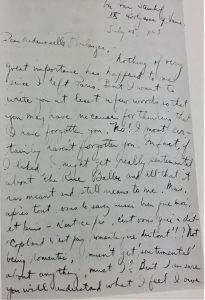 This brings up the question of whether or not he should have written this at all. I hesitate to say he should not have. 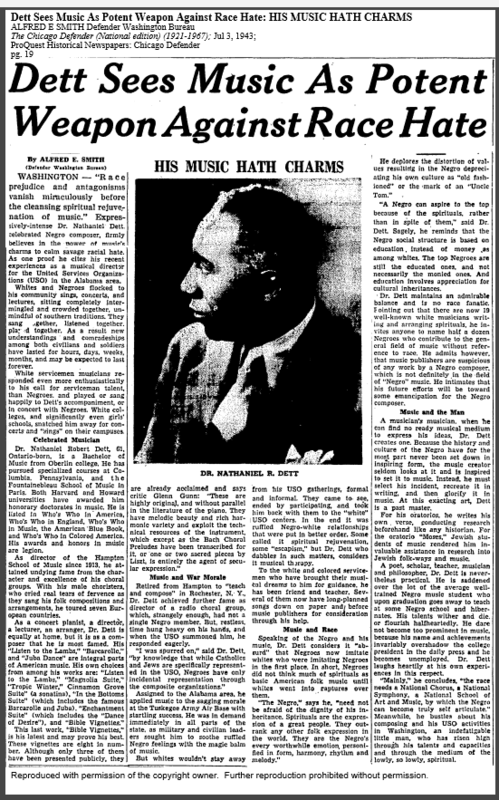 Whether that is simply because it is beautiful music or because there is some other argument that he contributed to American music in a way different than MacDowell (who contributed to a “vanishing Indians” idealogy), I cannot say.1 This piece, especially controversial given its dialect text, would be an excellent addition to our class exhibit, however. Since I own a personal copy, and we can give people a QR code that lets them access it online and peruse anytime, I think that it is an accessible source that many could use.